Electric Car Maker Tesla Will See First Quarterly Profit : The Two-Way The company said it will deliver 4,750 of its flagship Model S, its much-lauded four-door, luxury sports sedan. That amount exceeds its earlier estimates of 4,500 cars sold this quarter. 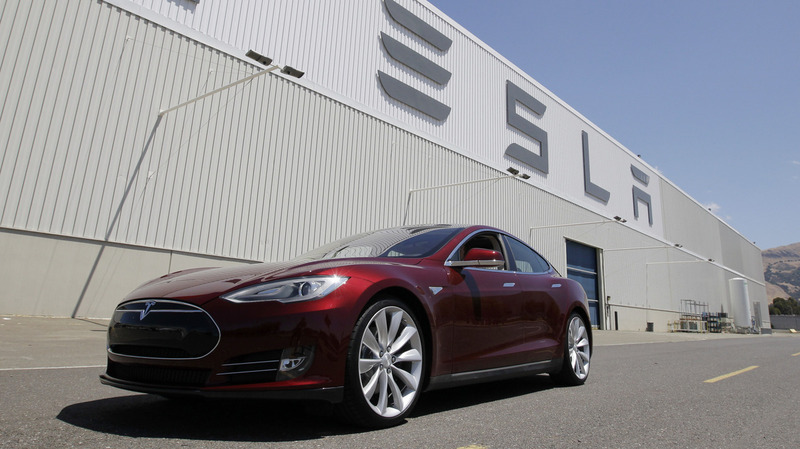 A Tesla Model S drives outside the Tesla factory in Fremont, Calif., on June 22. The electric car was named Automobile of the Year by Automobile Magazine and Car of the Year by Motor Trend. Tesla Motors, the car company on a mission to change the auto industry, announced late Sunday that it's finally turning a profit this quarter. The company said it will deliver 4,750 of its flagship Model S, its much-lauded four-door, luxury sports sedan. That amount exceeds its earlier estimates of 4,500 cars sold this quarter. This is good news for the freshman carmaker, whose profits some posited might have been negatively affected by a harsh review in the New York Times, a review Tesla CEO Elon Musk said was full of lies. To be clear, Tesla is in California, so it is not April Fool's yet! Also, some may differ, but imo the Tues news is arguably more important. Tesla also said it will discontinue its entry-level option, which was equipped with the smallest battery available, a 40-kilowatt hour version with a much shorter range (about 160 miles). The company said only 4 percent of customers chose the smaller version. "Customers are voting with their wallet that they want a car that gives them the freedom to travel long distances when needed," the statement said. The company will stick with its 60-kilowatt hour option, which offers an estimated range of 230 miles per charge.